Women who've passed the Army's grueling Sapper Leader course say they're well-prepared to enter combat, and in some cases, better prepared than men. NBC's Jim Miklaszewski reports. Speaking to reporters at the Pentagon, the secretary vowed that the decision would not compromise military readiness and pledged that the armed forces would not lower standards for service, such as for physical fitness. President Barack Obama said in a statement that the decision would “be another step toward fulfilling our nation’s founding ideals of fairness and equality,” themes that he sounded three days earlier in his second inaugural address. The deaths of more than 150 American military women in Iraq and Afghanistan, the president said, demonstrate that “valor knows no gender.” Another 1,000 women have been wounded in the nation’s two most recent wars. The decision replaces a 1994 military policy memo signed by Les Aspin, a defense secretary under President Bill Clinton, that excluded women from assignments to units below the brigade level if the unit would be engaged in direct combat. The change is expected to open 230,000 front-line positions to women. Nearing the expected end of his own time as defense secretary, Panetta spoke of visiting Arlington National Cemetery and seeing no distinction between men and women who had given their lives in defense of the country. The secretary said that there would be a review period for each of the armed services to see if there are any jobs that should be excluded. He wants recommendations on his desk by May 15. But Pentagon officials said it might be next year before specifics are worked out and women can begin applying for the newly opened positions. Asked specifically about special operations units such as the Navy SEALs and Delta Force, Gen. Martin Dempsey, chairman of the Joint Chiefs of Staff, said at the Pentagon briefing that he believes there are women who would meet those standards. 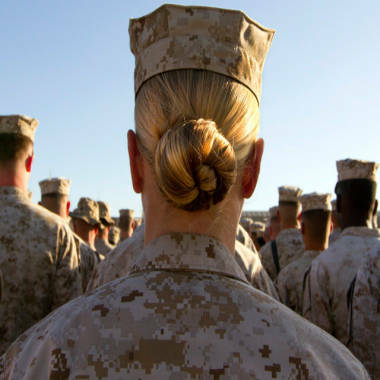 For years, women in the military, and outside groups such as the American Civil Liberties Union, have argued that women already serve on the front lines but are not recognized for it. Women constitute 15 percent of the active-duty military. Panetta said repeatedly that he had been impressed by the role of women in the wars in Iraq and Afghanistan. “We are making our military stronger, and we are making America stronger,” he said. Critics of Panetta’s decision had expressed concern that allowing women to serve in combat roles could harm unit cohesion and weaken military readiness. Others said they worried about lower standards for physical fitness, leading to a weaker fighting force. Sen. John McCain, R-Ariz. and a former prisoner of war in Vietnam, said earlier Thursday that lifting the ban was “the right thing to do,” but he stressed that the military should make sure physical standards are met. Reaction on Capitol Hill appeared mostly positive. Sen. Kelly Ayotte, a New Hampshire Republican, congratulated Panetta for the decision in an interview on “Andrea Mitchell Reports” on MSNBC. “I think this is a very positive step, and it reflects the reality of what’s happening, obviously, in defending our nation,” she said. Defense Secretary Leon Panetta and Joint Chiefs of Staff Chairman Gen. Martin Dempsey announce that the military is lifting the ban on women serving in combat positions. Watch their statements.